To celebrate the 70th anniversary of Lebanon’s independence, Lebanon’s Central Bank issued a 50.000 Lebanese Lira banknote, uniquely designed to commemorate the occasion. The new design, released a week before independence day, was heavily criticized by the public, particularly on social media. Most of the critical opinions on the new design were short, personal, and did not go deeper than the surface: some voiced their negative opinion about the visual aesthetics of the banknote and its clutter of effects and colors, calling it a “Photoshop massacre”. Others were shocked how the banknotes had spelling and grammatical mistakes. Many joked about the bad design and creatively looked at it with a sarcastic eye to reflect their disapproval of it and make fun of the incompetence of the Lebanese government. All these reactions are for a good reason: the design is by all means one big failure. It is mainly a failure by the government to understand design, as a profession and as a practice. What is needed in my opinion is a clear and elaborate explanation why the design of this new banknote is a failure: a chance maybe to educate our government about design and to provide constructive criticism that can help avoid such pitfalls in the future. Judging design is not a matter of pointing the “ugly” from the “beautiful”. In my analysis of this design I will leave the aesthetic visual judgment till the very end- assuming that this can be a relative matter depending on personal taste. I will look as a start at all other aspects of design besides “beauty”, to explain the failure of the banknote design. Let’s start by “design function”: Every design has a function and is conceived to serve a very specific purpose. The function of this design was to celebrate independence day. Obviously the core purpose of this function has been lost since the banknote became the talk of the town for all the wrong purposes, its inappropriate design solution. The government’s goal to highlight the positive aspects of Lebanon’s independence ended up being the public’s joke about everything that is wrong in Lebanon since its independence. The other basic function of this banknote design is, of course, being a piece of money to be used. The most basic requirement in money is clearly showing the “number” associated with it, to allow its user to know its value. Ironically enough, the number 70- referencing to the seventy years of independence- is larger and more prominent than the number 50, which refers to the currency’s value of 50.000 L.L. This is a disorder of information hierarchy that can be very confusing for the user: how would a tourist, not necessarily familiar with our money system, avoid being confused by the different numbers on one single bank note? How would this design deliver information clearly and quickly without the slightest risk of misunderstanding, especially when it is a new banknote the market is not familiar with? Let’s look as well at another important aspect of design: design process. Design is not simply a matter of coming up with a great idea. It is actually a series of steps that carries an idea into becoming a product. A design process consists of conceptualizing, designing, finalizing and producing. A professional design team will go successfully through all these stages and will ensure that the end result is as complete as it should be and free of mistakes. Even the greatest ideas will risk failing if not executed properly. I talk about the design process to explain that the spelling and grammatical mistakes in the banknote’s new design are not simply “accidental mistake” that could just “simply happen”: they are mistakes that result from certain faux pas in the design process. 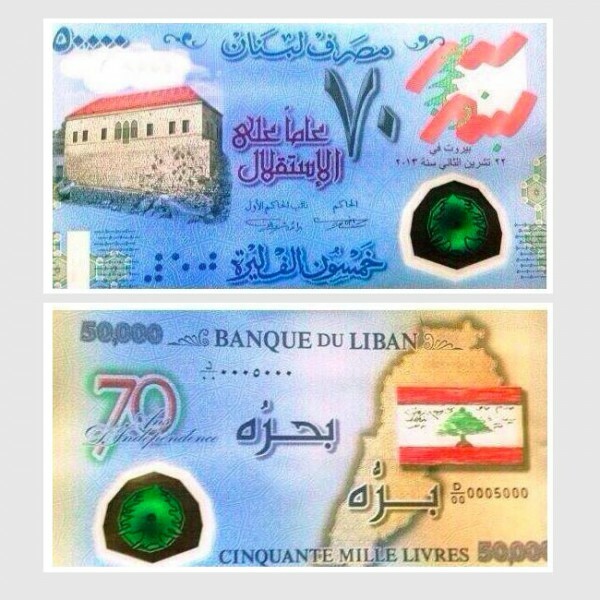 The notes had two outrageous mistakes: the first one being the wrong spelling of the French word “indépendance” – which was wrongly spelled in its English spelling on the French-language side of the banknote (Lebanon being officially a bilingual Arabic-French country). The second mistake is an Arabic grammatical mistake, caused by the wrong placement of the “fatha” accent mark on the “sad” letter in the word “masraf” instead the “meem” letter. This simple misplacement mistake ironically changes the meaning of the word “Lebanon Central Bank” – مَصرف لبنان- to something like “Lebanon did not spend” مٓ صٓرف لبنان. Such mistakes would never occur if a healthy and professional design process were adopted. Following each step of the process, it is impossible for a professional designer to understand how such mistakes went unnoticed. It is common practice that when a design is approved, it is signed-off upon after reviewing every single detail. Once it is sent to the printing press, a printed mock up is sent by the printer back to the design team for a final check and a final approval, prior approving it for mass production. The claim of the Lebanese Central Bank that the French spelling mistake is caused by the printing press doesn’t provide a convincing explanation: blaming the printing press for a spelling mistake is simply the oldest trick in the book. The design team has to always approve the sample print provided by the press. A professional printing press doesn’t print mass quantities before a final check and a final signed approval. Nothing can explain on the other hand the Arabic grammatical mistake. This happened purely out of lack of proper understanding of Arabic and could have been easily avoided by having an Arabic copywriter or linguistic check the spelling and details of the very few Arabic words used on the note before sending it off to print. Bottom line: mistakes are easily avoided in design if the right and basic process is followed, and if obvious checking steps that are common practice in the field are followed. When printing a simple business card for personal use, at least three rounds of content checking will avoid the possibility of any mistake. How can printing national money not follow even more strict reviewing rules? Let’s look as well at “design features”, which are the characteristics of a specific design to make it serve its function better or enhance its overall performance. The design of the new Lebanese banknote included an additional tactile printing technique that will help visually impaired people know the monetary value of the banknote. While such initiative is highly welcomed; one can’t help but question the necessity of it in this particular context: this is a limited edition banknote made for a very specific occasion and in a limited run. Is making it usable for the blind really a priority? Wouldn’t it be better to make such features part of the regular banknotes so that visually impaired people can actually use the money they require daily without any confusion? This design feature seems then not needed or practical and seems simply added to the design for the wrong reasons: Lebanon has no basic infrastructure whatsoever for the visually impaired people, such as accessible pedestrian signals or any environmental navigation support; which seems the first priority needed before even thinking about the blind using banknotes independently. Let alone that having a tactile feature for only one banknote and not all of them is definitely not a usable solution (you would need change for your 50.000, right?). It is ironic as well that the design tries to take the blind into consideration- yet fails to take the people who can “see” into consideration, by presenting them a design full of mistakes and full of wrong visual choices. Which leads me finally to the “visual aspect” of the design. It is obvious from what I mentioned above that the design team of the new banknote and the management coordinating it are by far inexperienced in the design sector. It is not a surprise then that one can’t expect much out of the “visual design” qualities of such a team: when even the basics of a design process are misunderstood; and when the basic function of design terms are ignored- it is safe to assume that whoever was involved in this design does not have the right background to create a basic decent design for the banknote- let alone a cutting edge visual design. As a matter of fact, it is logical that the visual aspect of the design is poor and looks rather an amateur work. Every professional graphic designer can agree on this. The color harmony is off; the typographic effects are outdated and cheap; the overall appearance doesn’t reflect the serious context of the note; the composition is weak and unattractive and the different illustrative and typographic elements are randomly placed next to each other. There are a lot of reasons why this design fails besides the fact that it is not “beautiful”. One thing is for sure: this banknote is without a doubt a valuable collector’s item. I will be the first to try to get it and keep it in my design collection. It will be a classic case study of the importance of design and the pitfalls of underestimating it. I am not the kind of person that criticizes the work of other designers easily. I know that even the smallest design jobs are difficult, and I actually don’t blame the designer behind this banknote for this failure. It is the management at the Lebanese Central Bank that holds the responsibility of such design failure: they failed to allocate the right design team for this and to manage the process accordingly and create the right professional set up for the job. They failed to implement a strict process and policy that will ensure reaching good final design results: something that the bank has certainly managed to do successfully in the past when they produced iconic designs for the old Lebanese banknotes that were used in the early eighties and earlier. Designing good banknotes is absolutely not an easy task. The Lebanese Central Bank underestimated it- and hopefully the negative publicity generated by this outrageous design result will impose more serious steps towards allocating such jobs to the right design team in the future. Such design failure can only be avoided when the appropriate professional design party is assigned to do the job. The process of assigning and selecting the design team to undertake such a job should be the starting point that needs re-evaluation, in order to ensure better results in the future. A group of design consultants should be asked for advice to set clear steps defining the process of hiring the right design group to design and produce any new banknote. Where to find such consultants? I advise the governor of the Central Lebanese Bank to take a walk to the campus of the American University of Beirut, a 10 minute walk from his office in Hamra: AUB has been the first university in the Middle East to introduce a graphic design program 20 years ago. The university has graduated designers that have excelled internationally in the field of design, giving Lebanese design a very strong reputation in the Arab world. Other Arab governments – and even European and American governments – have regularly commissioned professional Lebanese graphic designers for some of the most complex and challenging national and governmental jobs: the results have often been outstanding. Lebanon has certainly the right and professional design talent. It lacks unfortunately the proper governmental body that knows where to find it. Beirut born Tarek Atrissi is an award winning & internationally acclaimed graphic designer, running his Netherlands based-office design studio, Tarek Atrissi Design. He is a graduate of the School of Visual Arts in New York and has been regularly working with various governmental bodies in Europe and the Arab world on multidisciplinary design projects.